If you’re planning on taking the SAT, it’s normal to be stressed about the Writing Section — especially if you feel like you have a really loose grasp on how sentences actually work. Here’s the good news: you don’t have to re-learn everything there is to know about the English language…you just need to know the basic strategies that are essential to scoring well on the SAT Writing Section. And we’ve got you covered! To get you started down the path to crushing your SAT Writing Section, we’re proud to present our brand new SAT resource: the “SAT Writing ESSENTIAL Tips and Strategies” video. What Will I See in the “SAT Writing ESSENTIAL Tips and Strategies” Video? 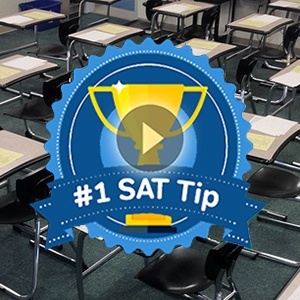 In this free video, our SAT expert Chris will give you a brief introduction, followed by the four MOST IMPORTANT strategies for knocking it out of the park on the SAT Writing section. 1. The most common errors on the SAT writing section! 2. Rules for sentence structure (including a second free video lesson)! 3. Why you should use official materials! 4. The key to good pacing! Hello, this is Chris, the SAT tutor at Magoosh, and I’m here today to talk about tips on the SAT writing section. That’s right, that’s the grammar section. So, obviously, first tip is, know all of your grammar, memorize a big huge grammar book, right? The first tip is, actually, to know the common errors on the SAT writing section. That’s right, they choose maybe from about, a little grab bag of about ten tricks, ten grammatical things that you need to know. And if you get good at that, that’s really all you need to know for the SAT writing test, in terms of grammar. So don’t be cracking open some huge grammar dictionary, just know the common SAT errors. Next, this is a big one. This is grammar based, but it’s very specific, and I feel that I see this in students all the time. They’re missing fundamental understanding of sentence structure. What’s the difference between an independent and a dependent clause? No, there’s a lot more than just the end versus the independent dependent thing. It’s the idea that, well, I’m not gonna go in length into it right now. Why wouldn’t I tell you about this all important thing? Well, I will but in another form. It’s gonna be da, da, da, da, da, a free lesson. I’m making a free lesson in the Magoosh premium SAT product available to you. If you click in the description below, on that link, you will get our sentence structure lesson video that will show you all you need to know about sentence structure and clauses. And it’s called the clause video. It’s gonna tell you the difference between independent and dependent clauses, and anything clause related that you have to know for the SAT writing section. Next tip is, to as much as possible, use official material. Well, there is a lot of other material out there that’s kinda easy. Well, we do, kinda, pretty good on the kinda easy material and we feel good about ourselves. And we are like yeah, we’re gonna rock the SAT. And then, we get there test day and it’s like, oh my gosh, a [UNKNOWN] tester evil. Well, people who write official test are the ones who wrote it. And, therefore, if you use this material first and this is what you get used to, you get used to the difficulties of this material, you will do much better test days. And, of course, you could use material like Magoosh as well that is also challenging, but official material is the way to go. Next, and last, I should say, all of this should tie together to this idea of good pacing. So you know your common errors, you know your sentence structure, you’re using official material, but you’re still struggling, you’re running out of time. Well, wait a second, what’s going wrong? First off, there are certain common question types that are more difficult than others. The adding and deleting the sentences, the ordering of sentences in a paragraph, those are all difficult. So don’t necessarily do those ones right away, or the first thing you do in a passage. In fact, do all the other questions relating to the passage, and then go back to the harder, more involved question types. And if you aren’t even finishing the writing section at all, you’re still running out of time, guess what? These questions, the hard questions, they’re not worth more than the easy questions, so just skip them entirely. Do all the other questions first in the section, and then, at the very end, if you have time, then you can come back them. But, again, you won’t get extra points for doing these hard questions, so make sure you know these pacing tips and bring in all the other good stuff I talked about today. And, of course, if you want more great advice on this, check out our SAT channel. And again, I am Chris at Magoosh, and I will see you next time. Want More SAT Writing Tips?